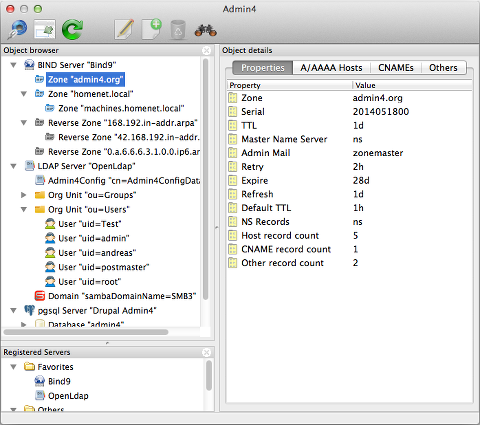 Admin4 is a tool for server maintenance via several plugin modules, running on Windows, Mac OSX, Linux and many more platforms. Currently, plugins for BIND DNS, LDAP, IMAP and PostgreSQL are included. It is designed as a framework, using Python for fast development of plugins and custom modifications. The DNS supports browsing and editing of DNS zones. The plugin should be able to query (axfr) any type of server, and performs updates via DDNS which insures that it won't interfere with other DDNS clients (DHCP, SAMBA4). For Bind 9.7 and up, statistics are supported as well and used to retrieve the server's zones automatically. The LDAP plugin features browsing and generic editing of all types of LDAP entries with schema support. In addition, high-level editing of objects like users, groups and samba domains is supported. Custom objectClasses and attributes can easily be added. The goal of the plugin was to replace the windows-only ldapadmin tool with a portable solution. The IMAP plugin supports browsing and maintaining of mailboxes for standard IMAP4 mail storage servers. In is an everyday replacement for cyradm for Cyrus IMAPD servers, and should work with other implementations too. The PostgreSQL features a nice query tool, a data modification tool and an object browser. It's aimed to replace pgAdmin3 with a modified feature set targeted at professionals. It supports gui editing only for common tasks and objects to keep the gui lean, and emphasizes on features that increase productivity like object favorites, sql snippets and filter presets. The PostgreSQL module is still work-in-progress: object browsing is currently restricted to displying the most important objects.